Shibori is the Japanese technique of manipulating fabric by folding, squeezing, wringing or tying and today I was inspired to make a Shibori felt sample after seeing the one here that Ruth from Feltingandfibrestudio.com has created. The texture and colour scheme Ruth used was very dramatic and I thought this could be a great technique for me to use in a seascape picture to represent waves. I used two shades of blue Merino with the darker one on top and added some strands of pale blue knitting wool. I stitched the folds in place before fulling and once dry removed the stitching and snipped some of the darker shade to reveal the pale blue beneath. My piece isn’t as dramatic as Ruth’s but I am still pleased with how it worked out and can see it being a good technique to give my seascape a 3D look when I eventually get around to making it. I made a second piece out of some green/yellow Merino prefelt and this time tied small beads into the felt before fulling. 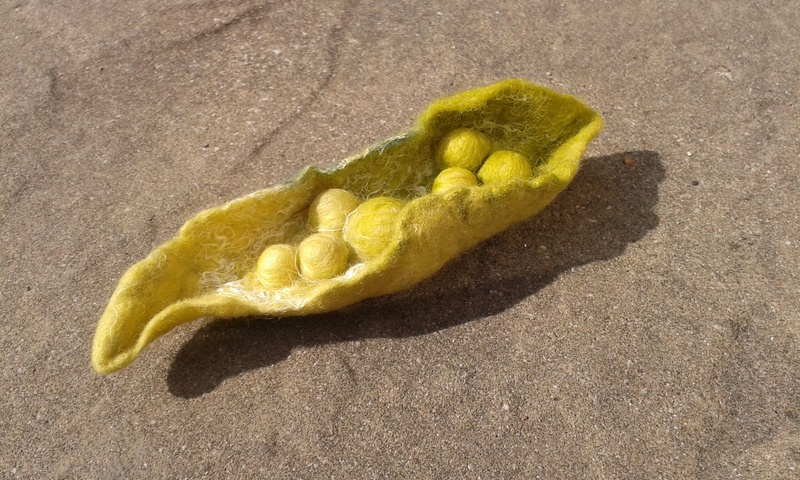 Although I had a ‘pea pod’ in mind when I started it I wasn’t too sure how it would turn out. I’m really happy with the result and I think there may be more Shibori experiments to follow shortly. Thank you Judy, glad you like them. Re the peas, they were made by pushing small beads into the prefelt and then tying them with dental floss. (I use floss a lot in projects as I find it is very strong and enables me to really pull tight when knotting it. 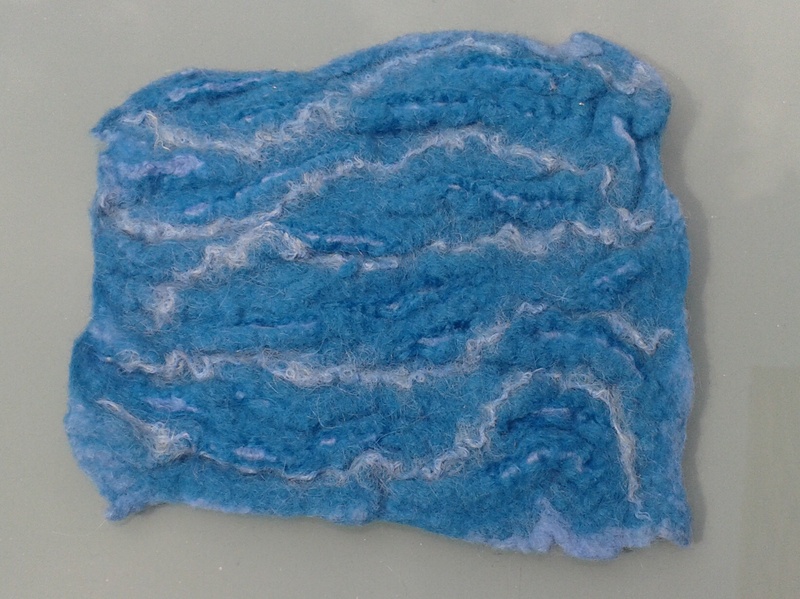 The piece was then felted and fulled as I normally would ie. rubbing and rolling. I had intended to remove the beads when I was finished but the back was felted so tight I decided it was just as well to leave them in place! I have seen some amazing scarves made this way (but with the beads removed). I will search some out and put them in my next post.